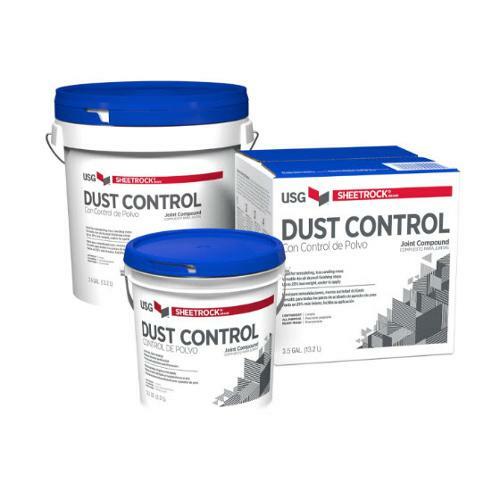 USG Sheetrock Brand Dust Control Joint Compound - 3.5 Gallon Box at Tamarack Materials, Inc. This innovative joint compound provides an easier path to OSHA compliance with no additional steps, manpower or equipment. Independent industrial hygiene laboratory testing during sanding of USG Sheetrock® Brand Dust Control Joint Compound has shown levels of total and respirable airborne dusts are below detectible limits of OSHA’s new permissible exposure limits (PEL). With USG Sheetrock® Brand Dust Control Joint Compound, fine dust particles bind during sanding to form heavier particles that drop to the floor, creating less dust and easier clean up.